"These pancakes are a chocolate chip cookie pancake and a brownie in one! As an added bonus, you have a pan of brownies to nosh on later! Breakfast and midnight snack in one recipe. 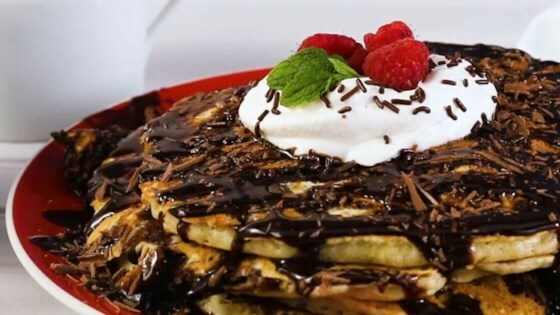 Serve pancakes immediately, perhaps with a dollop of whipped cream!" Have your chocolate chip, brownie and a pancake, too! The directions for making brownies are based on the particular brand mentioned. Follow instructions on the box if using a different brand.